Commonly referred to in The Bahamas as a Soldier Crab. Most hermit crabs salvage empty seashells to shelter and protect their soft abdomens, from which they derive their name. As hermit crabs grow, they must exchange their shell for a larger one. There are about five hundred known species of hermit crabs in the world. The various species range in size from the Pacific hermit crab, which rarely grows larger than a peach to Coenobita brevimanus which can approach the size of a coconut. Land hermit claws are unequal, with the major claw rounded and bright purple in color. Eyes are stalked. Body color is variable, ranging from reddish brown to paler tones. Legs are tan-brown to red in color and are marked with many purple dots and fine hairs. Carapace length may reach approximately 1.5 inches (3.5 cm). 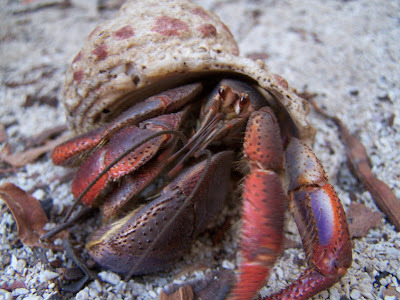 Land hermit crabs range from central Florida south throughout the Caribbean. Hermit crabs cannot reproduce in captivity.